You can watch The Texas Debate starting at 8 p.m. on Tuesday, Oct. 16, by joining KHOU 11 on air or all of our social platforms. The latest showdown in the battle for the U.S. Senate will be held Tuesday night at our sister station, KENS 5 Studios, in San Antonio. 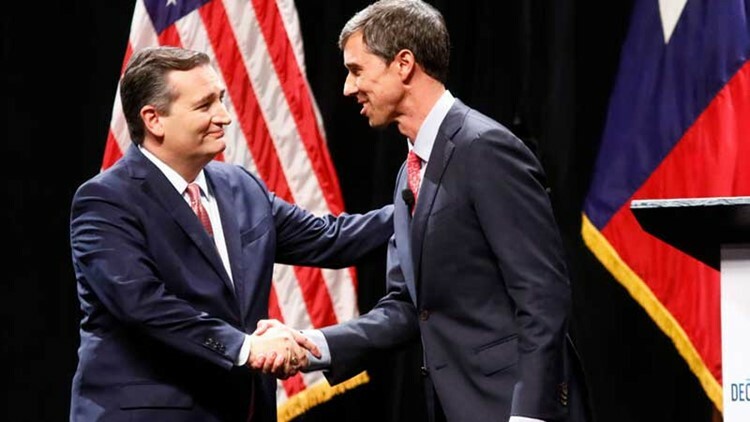 U.S. Sen. Ted Cruz, R-Texas will face challenger U.S. Rep. Beto O'Rourke, D-El Paso in their second debate. ON AIR: Watch KHOU 11 on major cable and satellite services or over the air. View our channel guide. WEB: We'll be streaming the debate at KHOU.com on your desktop or mobile browser. Just click the link on the homepage. APP: The debate livestream will be on the KENS 5 app home screen. Get our app on Apple or Android. FACEBOOK: The debate will be on Facebook Live. Go to facebook.com/KHOU11/. TWITTER: The debate will be live on Periscope. Go to twitter.com/KHOU. YOUTUBE: The debate will be live on our YouTube page. The debate will be one hour long. The candidates will stand at podiums in front of an audience selected by the campaigns. Questions will address both domestic and international issues. The moderators are Sarah Forgany of KENS 5 and Jason Whitely of WFAA in Dallas.